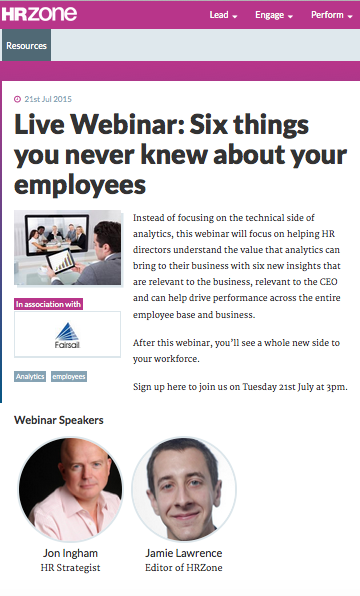 I'm speaking on this HRZone and Fairsail webinar on HR analytics on Tuesday 21st July at 3.00pm BST. We're still working out what six things we're going to be talking about, but it sounds like it's going to be a very interesting webinar, and will dispel a few myths about analytics. I'll be chairing Syncota's new Talent Disrupt conference in the Autumn - taking place at Heathrow on 25th & 26th November. Although faced with a continually changing, diverse environment, talent strategies have the ability to heavily impact organisational success for the better or the worse. Talent is changing, and now is the time to use your talent pipeline to create a company-wide competitive advantage. 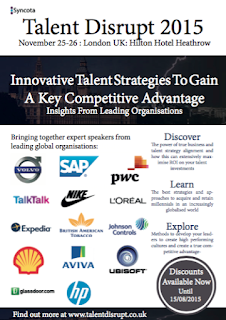 At Talent Disrupt you will learn best practices and strategies from large organisations, become inspired by case studies and great success stories, as well as hear about what not to do when it comes to our three key themes for 2015. If you want to join me, you can book here. 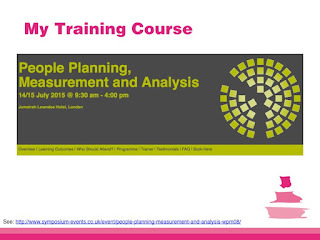 My own presentation at Symposium Events' Critical HR Analytics conference was on Engagement. The topic was Symposium's suggestion but I was happy to respond, having recently contributed along with Dave Ulrich to this article in HR Magazine about new engagement tools. And understanding engagement, like lots of things in HR, is increasingly about smart use of tools and technologies. Rather that just list the tools mentioned in the article (though I have added to them) I attempted to use the levels of value in the value triangle (see my last post) to help explain how organisations can best use all these different tools. I think this is important as the consequence otherwise is likely to be one of two things, neither of which are helpful! Either we pick tools at random. For example I hear a lot of claims these days that we don't need to run engagement surveys any more as we can either just do mini pulse surveys or rely on semantic analysis of our enterprise social networks. But actually whilst these tools are useful, it's important that we understand they're not direct alternatives to an engagement survey, they're complementary to this, acting at different levels of value. Or, we just add more and more tools to our portfolio of measures. This tends not to give us any more insight and reduces the chance that we'll see the real signal in all of the additional noise. The key to making best use of the available tools, in engagement, and in other areas of HR, isn't about understanding the levels of value in the technologies (though this is important), or in the data and analytics, but in the attributes we want to understand ie the type of engagement. 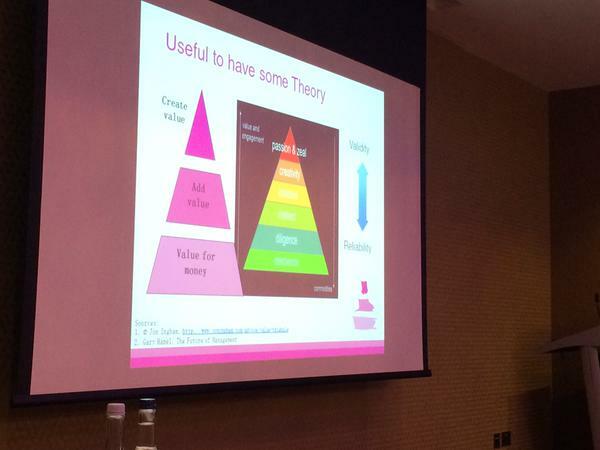 This is why I used Gary Hamel's triangle about different types of engagement on slide 5. As I explained in my last post, if we're tying to measure the sorts of things that will give us value for money at the bottom of the triangle - eg compliance, diligence and obedience, we'll probably be able to get lots of objective, reliable data, and can use appropriate analytical tools to explore these. Eg this is where big data fits in. In contrast, when we're dealing with Creating Value at the top of the triangle - eg passion and pride, creativity and zeal, we're more likely to need qualitative measures, and richer types of analytics and tools that help us understand these things. Nick Kemsley talked about this at the conference suggesting that strategic workforce planning would involve qualitative measures a bit like is often the case in marketing. So the best thing to do is to go and talk to people. That's true in employee engagement too. Focus groups still have a lot of value, particularly before or after an engagement survey. In summary, the tool we pick to use needs to depend upon the insight we're trying to create, which will depend upon the type of data we can access or generate, which depends upon the way we're trying to engage our staff. Understand the value of this and the rest follows. Yesterday was Symposium Events' Mission Critical HR Analytics conference. There were a couple of consistent themes I will blog on into next week, however the main (and very positive) one was the use of three level triangles! Paul Smith from LV= had his own version, dealing again with the analytics agenda at the top of Peter's triangle, but shown the wrong way up (so I've rotated the photo so you get to see it the way it's supposed to go!) In case you can't read upside down, this triangle moves from operational to tactical to strategic. They're both interesting models, that both relate to my Value Triangle, but the key issue which both Peter and Paul's models miss is that it's not analytics we need to worry about, it's not even the data we analyse, but the insight we're trying to provide. "It is important to note that HR analytics reverses the approach that characterises so much HR work of producing data then trying to find a problem to solve; instead, you start with the problem and look for the data to answer the question." Yes, exactly (though not all of the time), so let's put the question in the triangle! This is what the Value Triangle does which I used in my own presentation and you can out more about here. Anyway, just before me, Jo Taylor spoke about TalkTalk's approach which used the categories of value for money, adding value and creating value to identify the type of talent the company was trying to develop. Not actually a triangle but clearly the categories from the Value Triangle! It turns out that TalkTalk's consultant was previously a partner in another consultancy working with a guy who used to work with me and where we first developed this model. 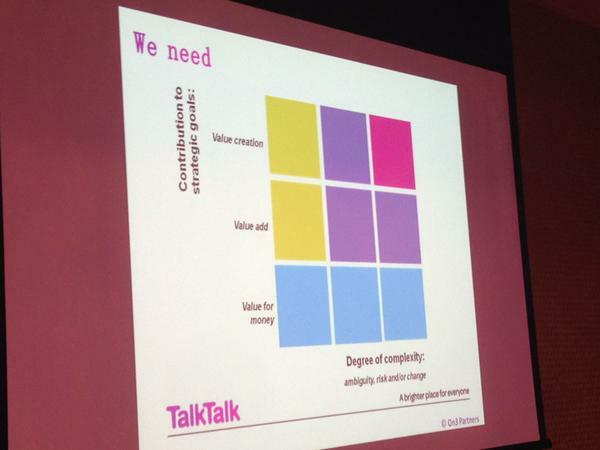 I think that TalkTalk's version has been corrupted slightly since then though as Jo suggested the idea of Future Back(starting with the end state in mind) requires thinking about the business whereas Creating Value is actually a very people centric perspective ie it looks at what people will be generating for the business, rather than what the business needs its people to do. But that's a relatively minor quibble in this context. In general, what better introduction could I possibly have got? This is the value triangle from my own session (thanks Jo) which I also linked to one of Gary Hamel's models to illustrate the approach I recommend in the context of generating employee engagement. I'll explain what I discussed regarding engagement in my next post, but the point I'd like to make now is to explain that it's not the level of data or analytic we need to worry about, it's the nature of the thing we're trying to measure. So if we're tying to measure the sorts of things that will give us value for money at the bottom of the triangle - eg compliance, diligence and obedience, we'll probably be able to get lots of objective, reliable data, and can use appropriate analytical tools to explore these. Eg this is where big data fits in. In contrast, in we're dealing with Creating Value at the top of the triangle - eg passion and pride, creativity and zeal, we're more likely to need qualitative measures, and richer types of analytics and tools that help us understand these things. Nick Kemsley from Henley talked a bit about this in his session on workforce planning, suggesting that if we want to create organisational capability (which is a great example of creating value), we can't look at WFP in a transactional way. We need to deal with the ambiguity which will exist at this level and be prepared to make subjective judgments about it. But actually this applies to anything we deal with, across the full range of HR and OD activities, which support creating value. It's something we still forget far too much (or perhaps sometimes don't realise to begin with.) Yes, we will generally want to start with the question we're trying to answer. And the nature of that question will influence the nature of the data we need to collect. And this will impact the nature of the analytics we need to perform. And as you'll see in my next post, this also influences the nature of the technology which can help us performance the analytics, visualise the insight and answer the question! And all from using the right triangle! 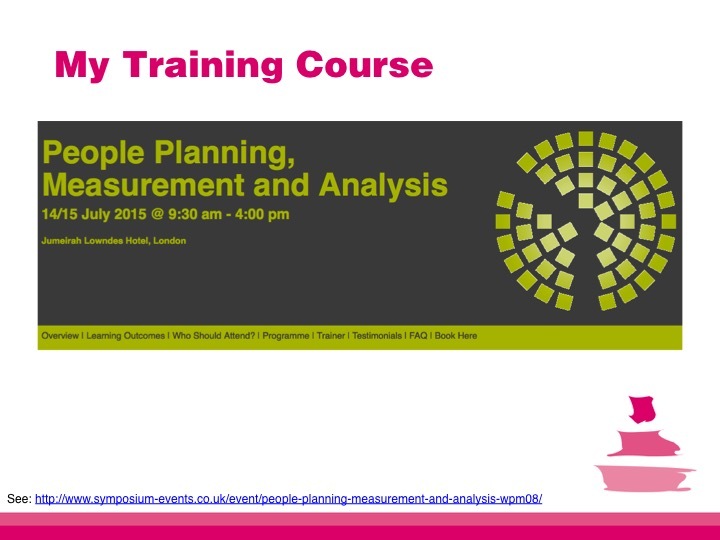 If you want to know more, the above slide from my presentations highlights one of the training courses I run for Symposium - on planning, measurement and analysis, where I cover all of the ideas I outline above, and a lot more! I can run it in-house as well if you'd be interested! 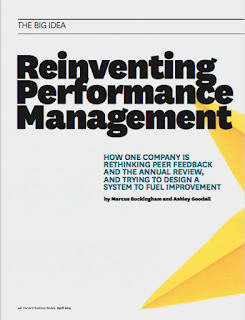 Buckingham dealt less with the more formal aspects of performance management but it’s this that was covered extensively in the Harvard Business Review. This project at Deloitte started with simple counting of hours - which for Deloitte added up to 2 million hours completing performance reviews and ratings. I know Adobe’s project started like this as well but in general, it’s unlikely to be that helpful for most organisation as it’s only the time and costs of performance management which can be measured so objectively - you’ve still got not basis to compare the benefits in the same way, so you might as well stick to a high level subjective comparison. The second input was a review of research in the science of ratings. A free this is useful and would extend it to the science of feedback and coaching etc - which is all part of the evidence based approach HR needs to take on board (though I’ll also be commenting on ‘evidence based HR’ shortly.) The key piece of data for Buckingham and Deloitte was that 62% of the variance in the ratings could be accounted for by individual raters’ peculiarities of perception. Actual performance accounts for only 21% of the variance. So traditional performance reviews are clearly very unlikely to work. I’d also argue that at the very least, even if you’re not going to separate the assessment and development sides of performance management, that reward shouldn’t be the top priority objective. Organisations can generate a lot more impact on performance by developing their people to perform than they can from the potential but complex impacts on motivation that might but might not follow from bonuses, incentives and salary increases. At the very least it is putting the cart before the horse. So in their annual, performance snapshots, they ask managers to provide four ratings - for pay, talent identification, poor performance and readiness for promotion. “And these conversations are best served not by a single data point but by many. If we want to do our best to tell you where you stand, we must capture as much of your diversity as we can and then talk about it. We haven’t resolved this issue yet, but here’s what we’re asking ourselves and testing: What’s the most detailed view of you that we can gather and share? How does that data support a conversation about your performance? How can we equip our leaders to have insightful conversations? Our ques-tion now is not What is the simplest view of you? but What is the richest? Please note I’m absolutely not against using big data to inform the conversation between the manager / team leader and employee, as this helps reduce the inherent bias in the process, but that’s different to arguing the overall assessment be based upon big data. The main problem with this is that by its nature the information contained in the big data is likely to be very transactional in nature, highly reliable but with low validity and meaning. So it’s not what you want your performance assessments to be based upon. I’d also question whether Deloitte really need its four ratings. Wouldn’t it be easier just to discuss each individual and if someone needs a higher salary, to pay them; if they need to go on a talent programme, then develop them; if they’re not performing then exiting them and if they need a promotion then promoting them? In his SHRM presentation Buckingham argued that big complex organisations will always need ratings as otherwise how does the HRD sitting in HQ make decisions about all their talent? That’s a pretty easy question to answer - they shouldn’t - at least for everyone who isn’t in a form of corporate interest group, all of these decisions should be taken locally where managers know the people they’re discussing. No form of rating is ever going to make the HRD doing this for all their locations etc a valid way of managing their talent. But the change hasn’t really shifted the dynamics of the way people are paid and promoted etc, it’s just got rid of the single rating of the rater’s performance as a stepping stone towards these ends. But the whole process is as riddled with bias as a more traditional approach. My final criticism of the approach is that Buckingham is at pains to stress leaders need to act in ways which suit their strengths (“there is no perfect profile there is only practice which fits your profile”), but recommends check-in as a one-size-fits-one approach within an organisation. I suspect that when businesses have developed the right best fit approach for their company, this will still need to be tailored and adapted by different teams and potentially individuals within the organisation.